The Olympics are known for creating stars out of its athletes. But one attendee has captured the internet’s attention without competing for a single medal. On Friday, NBC cameras spotted a little boy who was walking through Olympic Park. He was equally enamored by the NBC cameras, and seized his moment. Running toward the camera, he posed with his arms out on each side — sticking his tongue out and flashing two peace signs. The boy was so committed to his pose that he ignored the cameraman’s request for a high five. He also shrugged of his mom’s attempt to pull him away from the spotlight. But that wasn’t enough for him. Before going, he gave the camera an extreme close-up, sticking out his tongue again and appearing to lick the camera. 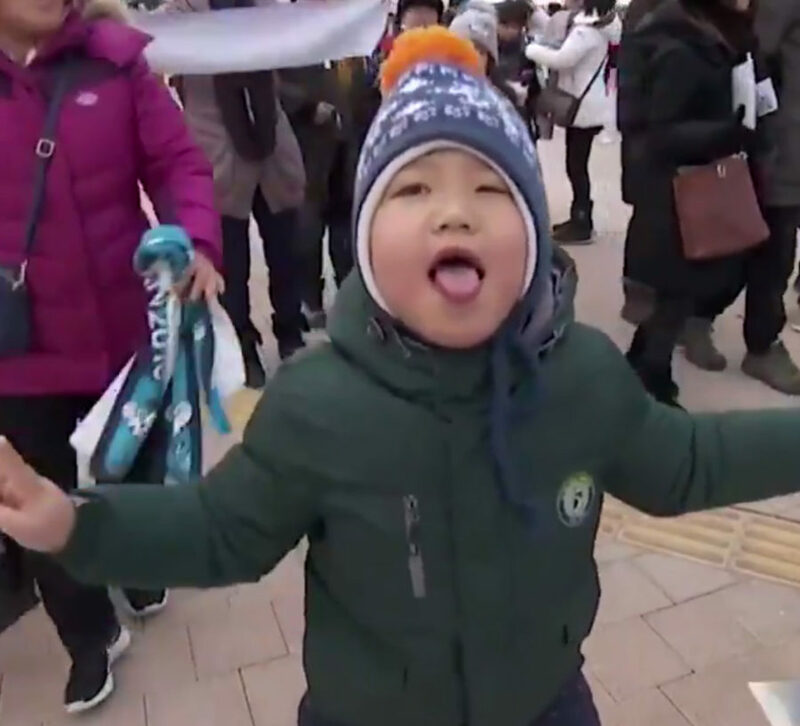 #Olympics Little kid trying to lick the camera, so adorable! South Korea opened the 2018 Winter Olympics in Pyeongchang on Friday night (Friday morning here in the states) with a bevy of lights and stunning moments in a display. In frigid temperatures and under the watch of spectators around the world, the opening ceremony began at PyeongChang Olympic Stadium in the mountains of Pyeongchang County. From an applause-inducing drum performance to the highly anticipated return of Tonga’s shirtless Pita Taufatofua, the Twittersphere was completely enraptured by South Korea’s Olympic opening, giving the show rave reviews. Viewers who missed the live-stream will get to see for themselves Friday evening, when the opening ceremony airs live on NBC. The 2018 Winter Olympics will continue through Feb. 25. To learn more, visit teamusa.org.